The procedure of choosing the structure of the system of distribution and commutation is considered, taking into account the requirements and constraints. The substantiation of accepted engineering solutions is given. The directions of improvement are indicated. One of the systems of the airframe ensuring Orbiter’s reliable operation as a whole is OBCN-MDC (onboard cable network-means of distribution and communication) system. It executes electric power supply under the set program from onboard and ground-based electric power supplies to the onboard systems of the airframe and Orbiter. provision of Orbiter multi-purpose usage. Besides, the structure and composition of OBCN-MDC in many respects depended, on the one hand, on the electrical power system, on the other hand, on the number and specific features of the airframe and Orbiter onboard systems’ electric power consumers operation. As the space vehicle of an aircraft type was under construction for the first time, at designing OBCN-MDC, it was necessary to take into account the engineering solutions, which were already tested in the process of space vehicles and airplanes maintenance. This quite often caused difficulties in reaching the necessary compromises. organization of auto-mode of monitoring and control. separate arrangement of plus and minus circuits of bundles, electric connectors and lines. Brief explanation and substantiation of the mentioned solutions is given below. The devices and bundles of OBCN-MDC are connected in such a way that form two independent electric power transmission channels each of which is arranged on one of Orbiter sides (see Figure). Thus, the normal power supply of the onboard systems is provided even at fault in one of the channels. more reliable protection against internal and external atmospheric (for example, lightning) or specially organized electromagnetic disturbances. Besides, it was necessary for usage of schematic design, which had been already implemented in some systems of Orbiter and tested on other flight vehicles. In these schemes, the presence of ‘body’ is not allowed in minus circuits. These reasons were decisive at choice of the two-wire scheme, despite of some loss in the total mass. The so-called ‘split scheme’ of electric power connections was used for the selected scheme OBCN-MDC to comply with the high requirements to reliability (including returning and landing at two faults) and in view of mass limitations. In this case the required cross-section of an electric circuit is composed by a number of wires, one or two of which are stand-by. Thus, one or two wires break does not result in a loss of onboard systems power supply. The indicated way of attaining reliability of power supply, in comparison with the alternate one, does not require over-commutation of power lines at failure and consequently has more simple scheme, with smaller number of elements. The controllable ‘design protection’ is made for detection of bundles contacts with sharp edges of the airframe construction and for protection of wires against mechanical damages, which stipulates that the wires of bundles are placed inside the metal braiding with a fabric electric insulation. The electrical insulation is checked up for damage (occurrence of the braid contact with metal details of the airframe) at Orbiter preparation to flight which allows timely to reveal and eliminate possible damage of wires. The reusable remotely controlled current protection is applied for provision of its repeated actuation at functioning. It concerns the current protection arranged in distribution devices, the access to which is hindered. The purpose of repeated actuation is to eliminate an unauthorized operation. In addition, it gives opportunity to block the current protection for increase of reliability of electric power supply at the injection stage of Orbiter flight. The mentioned above operations are executed under the commands coming from control system. The automatic mode of control and monitoring is implemented in OBCN-MDC. In the process of Orbiter preparation for flight and during the flight, the conditions of power contacts of remote switches, current protection of voltage on the trunks of devices are monitored automatically. The conditions of current relay assemblies of ‘design’ bundles protection, conjunction of electric connectors, serviceability of power diodes, separation of plus and minus power busses are also monitored automatically. These operations, as well as the control of power switches pursuant to the program of functioning, are made under the commands coming from the control system. The reliable and authorized commands transmission is provided with a voter circuit ‘two of three’. To decrease the probability of short circuits, plus and minus circuits are arranged with different bundles and electric connectors, and the laying of these bundles is made along separate lines at a definite distance one from another. - in Analogue 0002 plane and flying laboratory. As a result of the tests, the indices of reliability and service life necessary for Orbiter flight tests accomplishment were confirmed. Development and creation of OBCN-MDC are carried out under the direction and with direct participation of Mr. Kornilov V.A. the main works were accomplished by Mr.: Strelnikov V.V. and Ruzavin N.A. or under their direction, and the tests on stands – by Mr. Kovalev V.I. The design of distribution devices was developed under the direction of Mr. Soloviev A.M. (MAZ DZERZHINETZ). The OBCN-MDC scheme is selected for the particular spaceship in view of features of the electric power system, onboard systems - electric power consumers, power consumption and at the alteration of these conditions can be transformed. The experience of OBCN-MDC development and working-out can be undoubtedly used at designing the system of distribution for other flying vehicles including the perspective aerospace ones. A part of these innovations is intended for implementation in the system of distribution and commutation for orbital planes of reusable aerospace system of MAKS type. 1. E.V. Besedin, A.D. Vlasov. Qualitative Estimation of Methods Insulation Resistance Control of Double-Wire Systems of Power Supply of Direct Current // Collection of Works of NPO MOLNIYA. 1985. No. 6. 2. V.I. Kovalev. Galvanic Connections in Double-Wire Systems of Power Supply // Collection of Works of NPO MOLNIYA. 1985. No. 3. 3. O.M. Mironov. Transient Inductance of a Two-Wire Line of the Onboard Cable Network of Direct Current // Collection of works of NPO MOLNIYA. 1985. No. 3. 5. Ratclille. 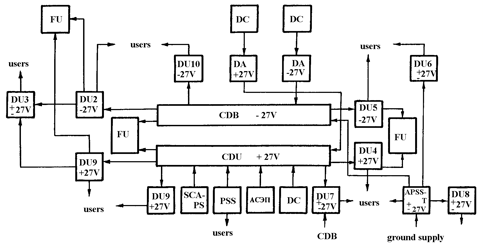 System Approach to Development of Power Supply on Modern Airplanes. British Aircraft Corporation Ltd, September 1977.